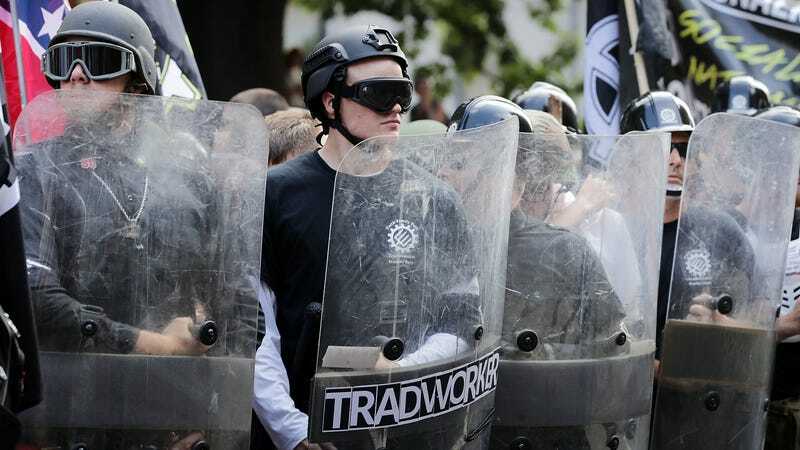 White supremacists, including one carrying a shield with the label of the now-defunct Traditionalist Workers Party, at Charlottesville in 2017. A subpoena against chat service Discord could reveal the identities of many of the neo-Nazis, white supremacists, and other far-right organizers involved in the planning of the disastrous 2017 Unite the Right rally in Charlottesville that resulted in widespread violence, three deaths, and scores of injuries. Per the Washington Post, a federal lawsuit by people injured during the events of the rally against its “alleged organizers” has hit a milestone. Discord, which was founded in 2015 as a chat app for gamers, quickly became a platform for psuedo-anonymous communication by numerous communities. That included many of the white supremacists allegedly present in Charlottesville, who might soon lose that anonymity. U.S. Chief Magistrate Judge Joseph C. Spero, who is overseeing the case, ruled on Monday that the plaintiffs have a right to know the account information of over 30 users on the server. That should give them further clues as to whether those people subsequently attended the rally, which could help prove their claims of malicious intent. However, he also ruled the Stored Communications Act prevents him from releasing the actual contents of the messages to the plaintiffs. On a Discord server called “Charlottesville 2.0,” they planned everything from car pools, dress code and lodging in Charlottesville to how one might improvise weapons in case of a fight. Some suggested using flag poles as a makeshift spear or club. ... In his 28-page ruling, Spero appeared to acknowledge why Discord might have been so appealing to members of the so-called alt-right in the first place: “It is clear that many members of the ‘alt-right’ feel free to speak online in part because of their ability to hide behind an anonymous username,” he wrote. In the months after the rally, Discord banned a number of servers and users promoting white supremacy, citing rules against harassment and threats of violence. Rendazza is still considering an appeal, according to the Post. Discord has a Terms of Service (ToS) and Community Guidelines that we require all of our communities and users to adhere to. These specifically prohibit harassment, threatening messages, and calls to violence. Though we do not monitor private messages, we do investigate and take immediate appropriate action against any reported violations. This was the case after incidents in Charlottesville where we swiftly removed servers and users from the platform and took steps to prevent their return. We are closely following any updates in the case and have been in communication with relevant parties over the last seven months, but can’t comment on ongoing litigation. We will continue to be aggressive toward bad actors on our platform.